When you are in GenSan and you are a recognized foreign of the city, it is rare if will not be offered by the Generals with their specialty the “Tuna Kinilaw.” This food is known for its distinct taste or just the way you like it. In addition, Tuna Kinilaw has been marked as the delicacy of General Santos City since GenSan is the tuna capital of the Philippines. Kinilaw means to cook any raw meat by soaking it to vinegar. 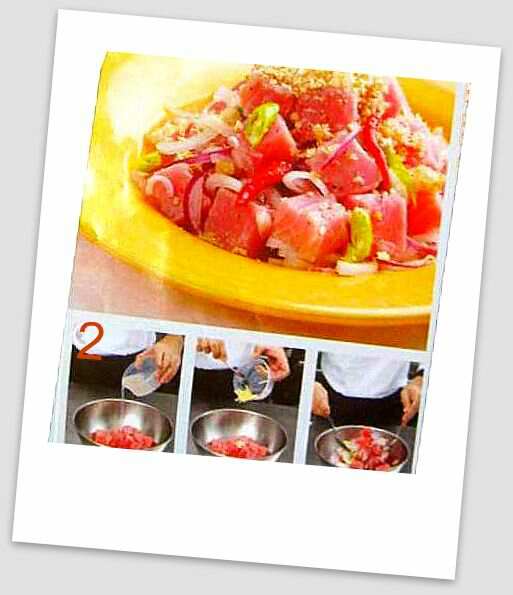 But the process do not actually undergo some cooking, since the tuna meat is only soaked to a strong vinegar solution that makes it look like it has been cooked. If you wanted to serve yourself some Tuna Kinilaw, you won’t find it a hard time. The recipe is surprisingly simple, yet it can drive your senses go wild to want for more of it. 1. Place tuna cubes in a stainless steel bowl and season with iodized salt and gorund black pepper. Let stand for a few minutes. 2. Add the spiced white vinegar or sukang paombong, calamansi juice, garlic, ginger, white and red onions and birds eye and finger peppers. 3. Transfer mixture to a serving dish and top generously with crushed chicharon. Serve immediately.